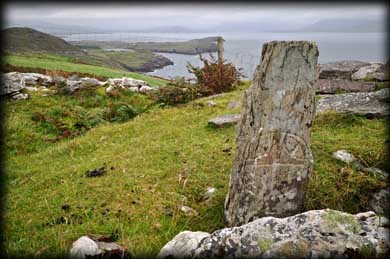 One of the highlights of our trip to Kerry in the autumn of 2012 was a visit to the Early Christian site at Kildreelig. 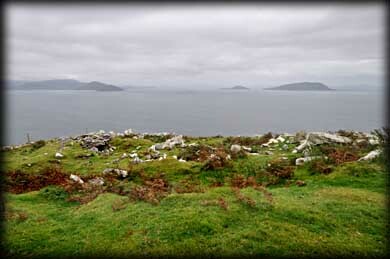 The site is located on the southeastern slopes of Bolus head overlooking Ballinskelligs Bay. From Ballinskelligs we drove west along the coast road to Cill Rialaig artists village, a retreat for artists, writers and poets located at a restored pre-famine village on the side of the mountain. We parked here and continued our journey on foot, taking in the stunning panoramic views of the bay. About a kilometre further along the track we finally came to the Early Christian Site. 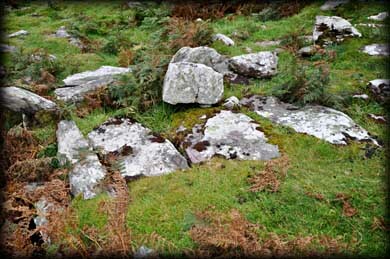 It would be quite easy to walk straight passed this site-from the road it looks like a pile of scattered stones. But on closer inspection you can make out the shape of an ecclesiastical enclosure. 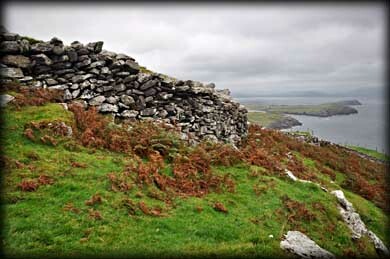 This one is in the form of a cashel-you can clearly see the circular walls on the seaward side. 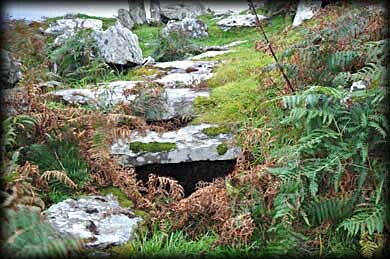 Inside the enclosure are the remains of a small oratory, a souterrain and the scant remains of severals huts or buildings. Near the rear of the oratory is a very early cross slab, see image below right. In the western sector of the cashel we could see the entrance to the souterrain-the lintels stones of the passage were exposed above ground. To the northeast of the cashel there is a leact, an outdoor altar, with another beautiful cross slab, pictured right. 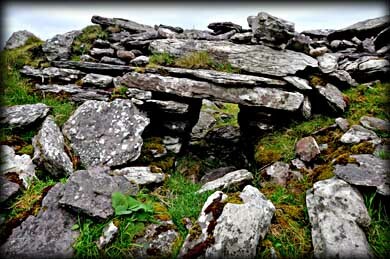 We believe this site may date to about the 8th century, but it has been suggested it may be earlier. 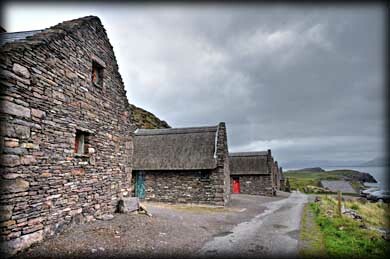 Situated: From Ballinskelligs holiday homes head southwest on the R566. 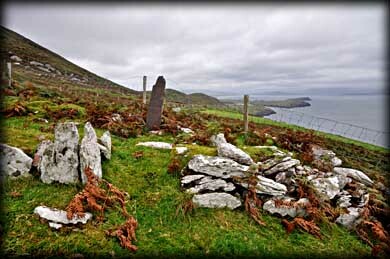 Then turn right onto the Skelligs ring. After 200 metres turn left at the crossroads. Then turn left off the Skelligs ring. Follow the road for 2.5 k.
Discovery Map 83: V 4061 6298. Last visit Sept 2012.